1 Frequently Asked Questions What is Xythos? Xythos is a secure web-based file storage system that allows you to place files in a central location so they can be accessed via the internet. You can upload, access, and share files from anywhere with any computer that is connected to the internet. 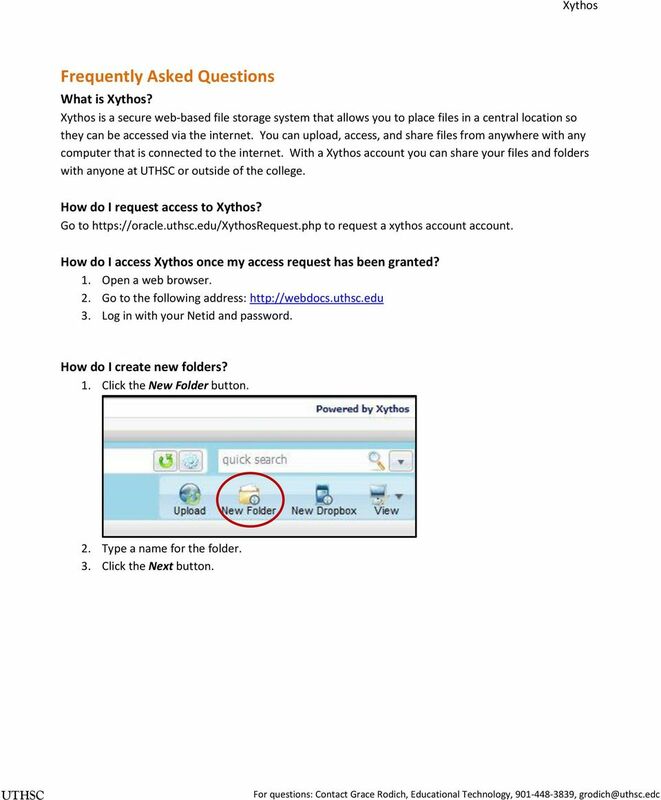 With a Xythos account you can share your files and folders with anyone at or outside of the college. How do I request access to Xythos? Go to to request a xythos account account. How do I access Xythos once my access request has been granted? 1. Open a web browser. 2. Go to the following address: 3. 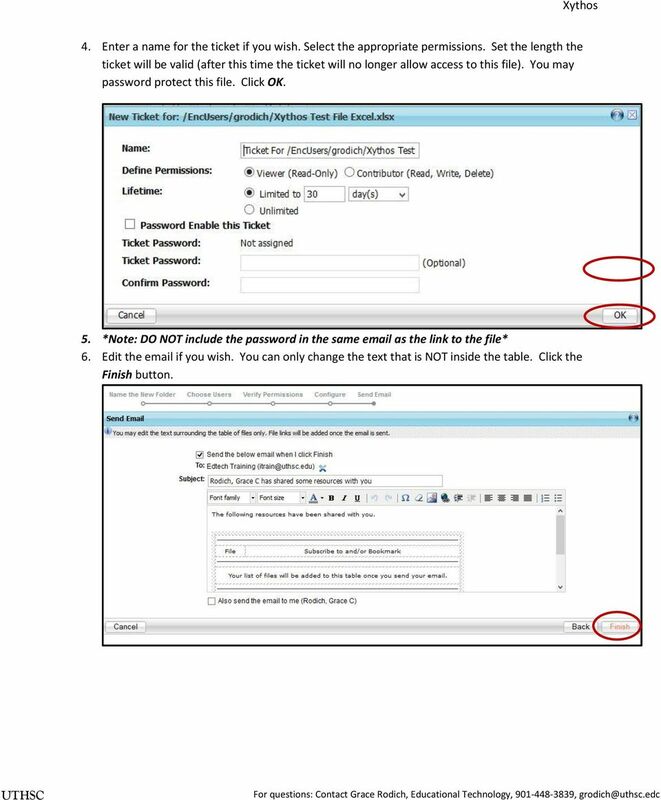 Log in with your Netid and password. How do I create new folders? 1. Click the New Folder button. 2. Type a name for the folder. 3. Click the Next button. 2 4. 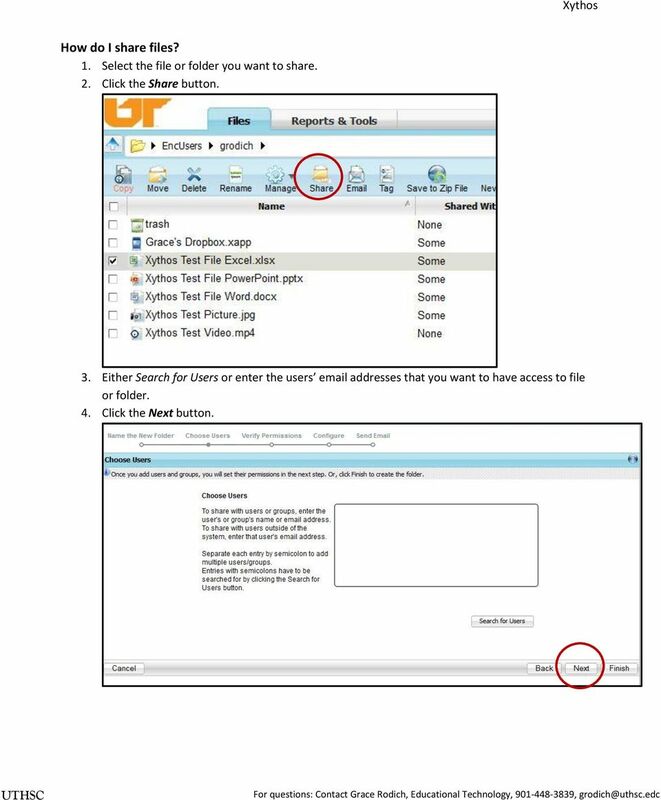 If you do not want to share the folder with other users, click the Finish button to create the folder. If you would like to share the folder, click Next. 5. Choose which permissions you would like to give your users. Click Next. 6. Define the default settings for the folder. Click Next. 3 7. Edit the if you wish. You can only change the text that is NOT inside the table. Click Finish. 4 How do I upload files? 1. Click the Upload button. 2. 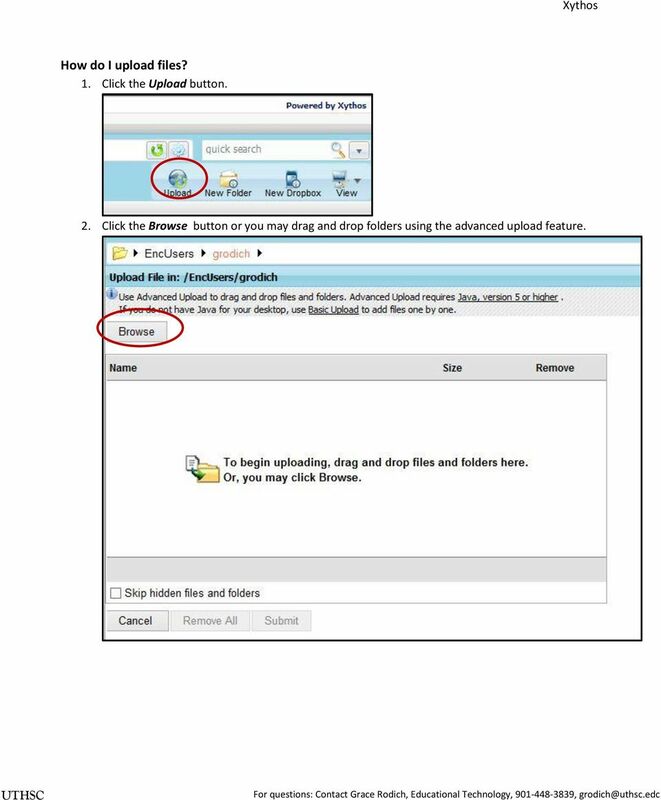 Click the Browse button or you may drag and drop folders using the advanced upload feature. 5 3. Choose the file you wish to upload and click Open. 4. You may upload multiple files by choosing Browse again. 6 5. When you are finished choosing your files, click the Submit button. 7 6. You will receive a confirmation that your files have been uploaded. 9 How do I share files? 1. 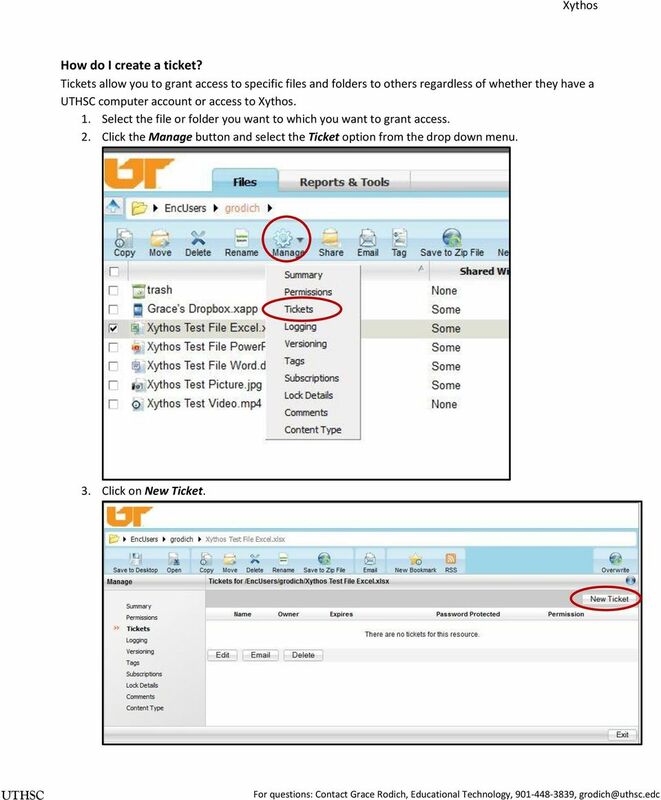 Select the file or folder you want to share. 2. Click the Share button. 3. 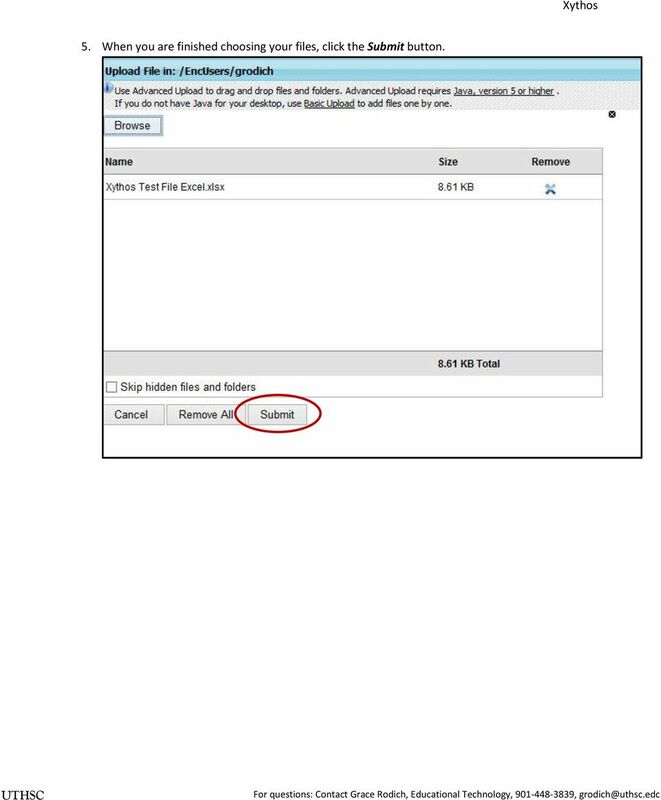 Either Search for Users or enter the users addresses that you want to have access to file or folder. 4. Click the Next button. 10 5. Select the appropriate permissions. Click the Next button. 6. Edit the if you wish. 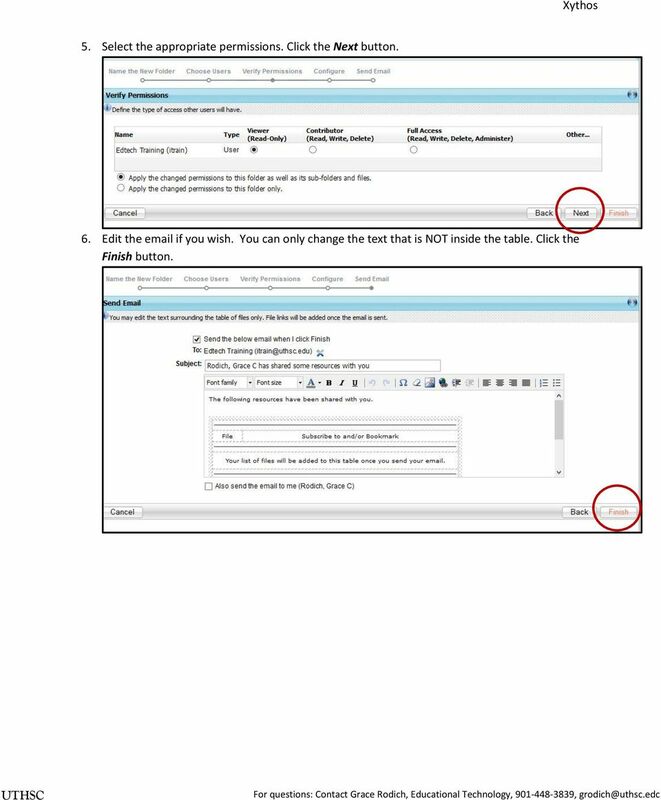 You can only change the text that is NOT inside the table. Click the Finish button. 11 How do I create a ticket? 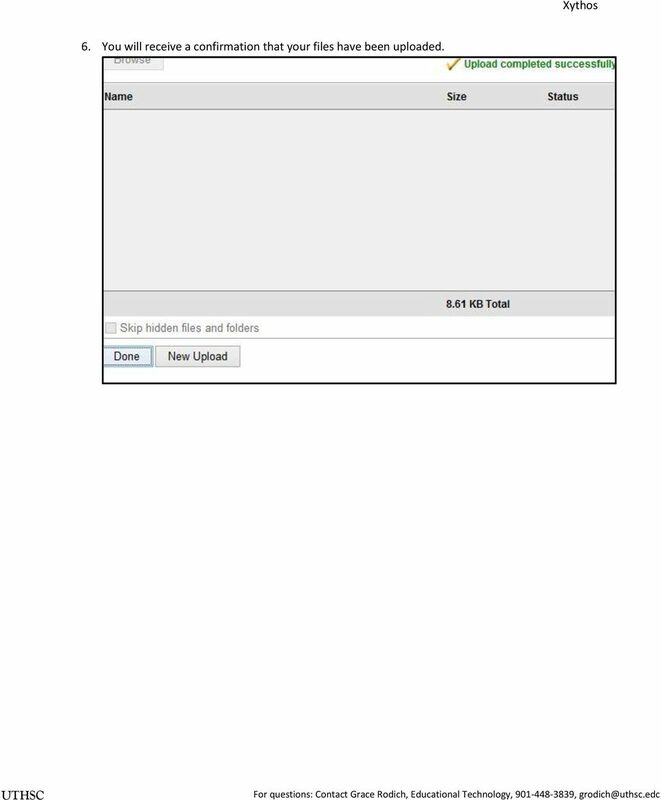 Tickets allow you to grant access to specific files and folders to others regardless of whether they have a computer account or access to Xythos. 1. 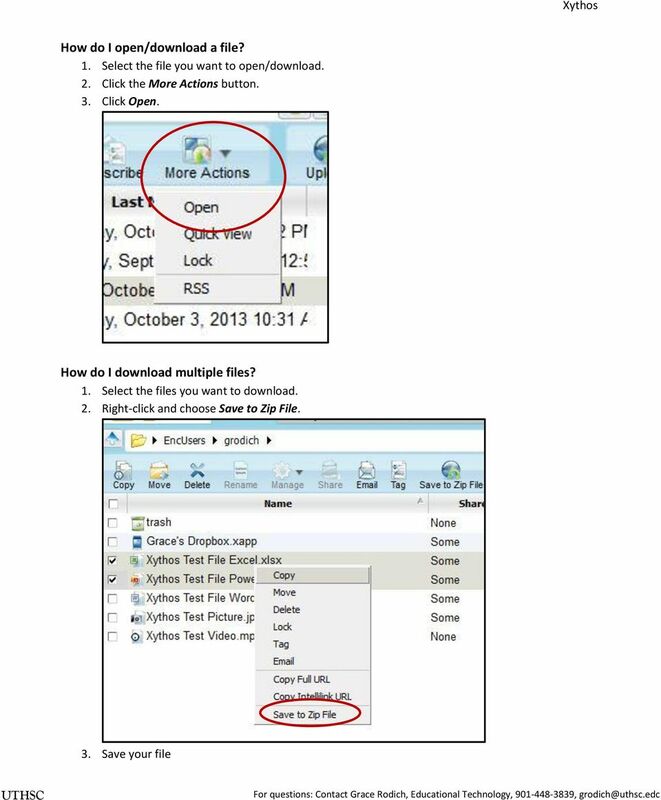 Select the file or folder you want to which you want to grant access. 2. 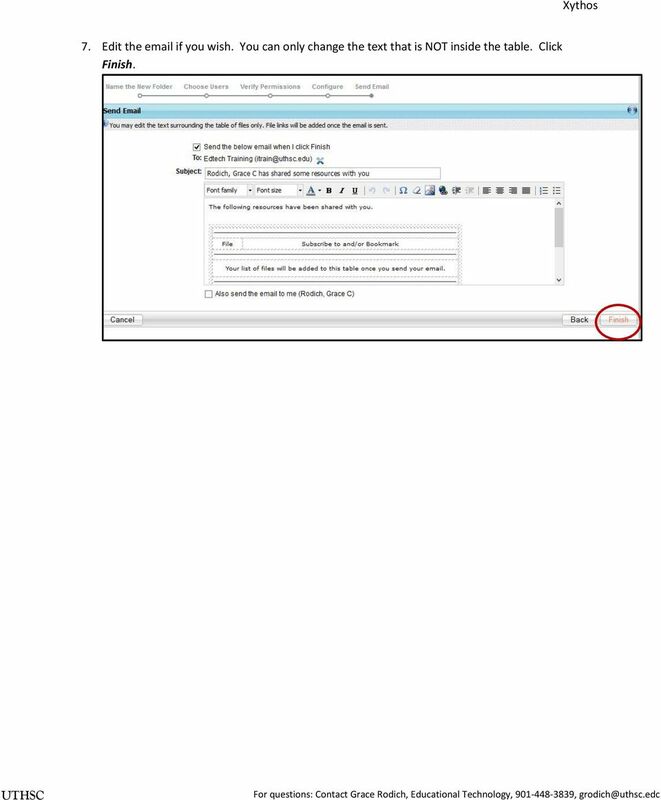 Click the Manage button and select the Ticket option from the drop down menu. 3. Click on New Ticket. 12 4. Enter a name for the ticket if you wish. Select the appropriate permissions. Set the length the ticket will be valid (after this time the ticket will no longer allow access to this file). You may password protect this file. Click OK. 5. *Note: DO NOT include the password in the same as the link to the file* 6. Edit the if you wish. You can only change the text that is NOT inside the table. Click the Finish button. 13 How do I manage permissions? 1. Select the file or folder for which you want to manage the permissions. Click the Manage button and select the Permissions option. 2. 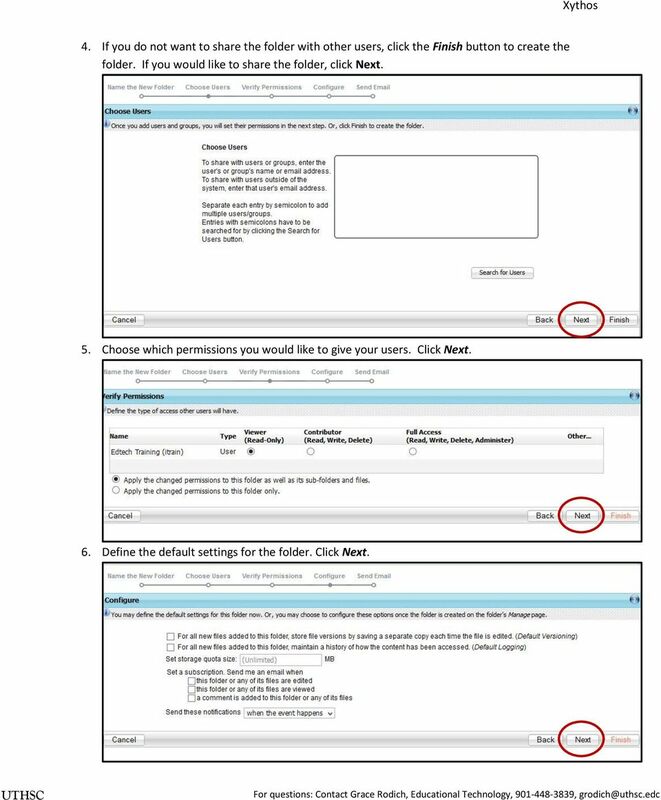 Make any changes you wish to the permissions and click the Apply button. 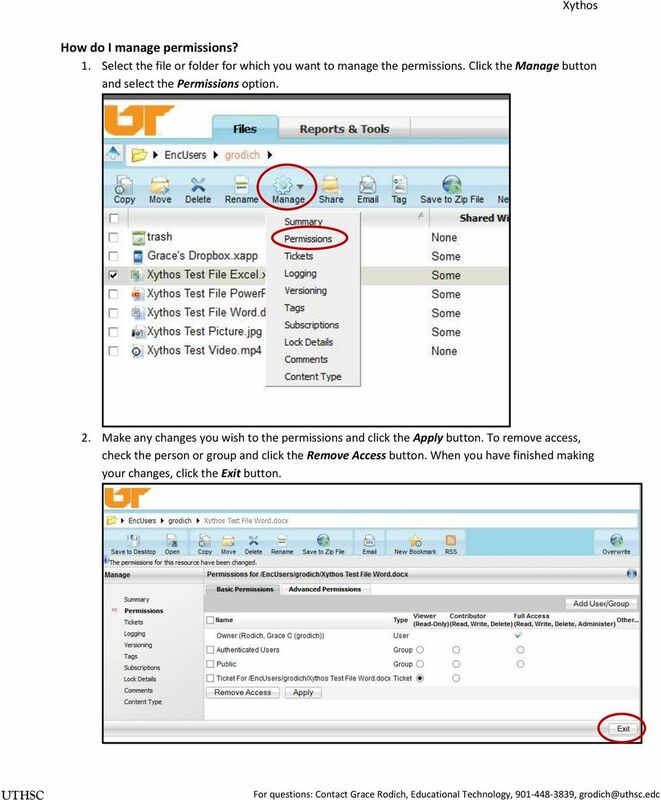 To remove access, check the person or group and click the Remove Access button. When you have finished making your changes, click the Exit button. 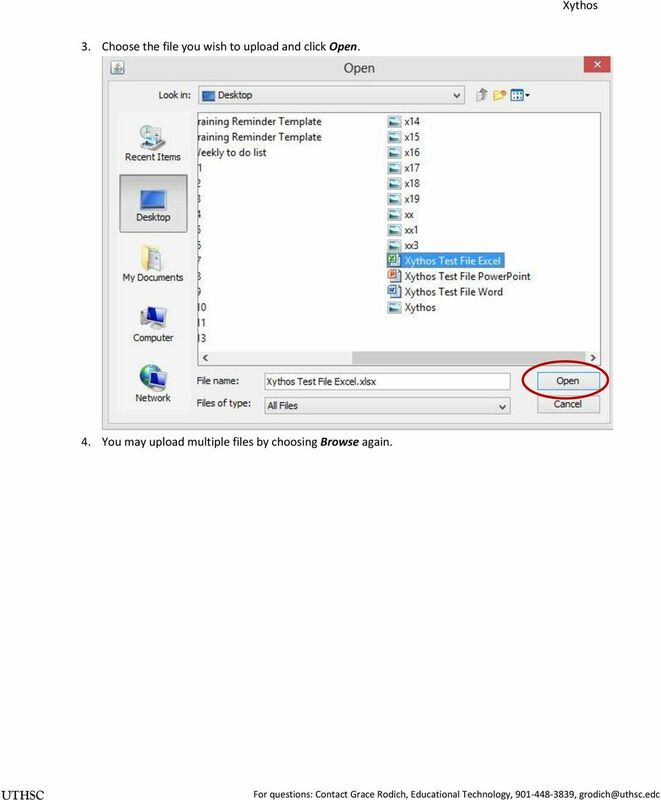 14 How do I recover a file I ve accidentally deleted? Much like on a PC, your files are not deleted permanently until you empty your trash folder. If you delete a file you may go into your trash folder and retrieve the file within 14 days. After 14 days the system automatically deletes the trash folder. Xythos Help You can see detailed instructions on various features by clicking the Help link in the top right hand corner.